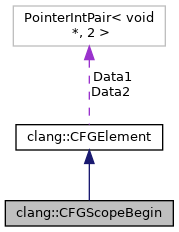 Represents beginning of a scope implicitly generated by the compiler on encountering a CompoundStmt. Definition at line 309 of file CFG.h. Definition at line 311 of file CFG.h. Definition at line 312 of file CFG.h. Definition at line 316 of file CFG.h. Definition at line 321 of file CFG.h. Definition at line 326 of file CFG.h.